When I was in college I lived for a time with friends in Los Angeles’ Mount Washington neighborhood, a hillside community of craftsman houses between the first American freeway and L.A.’s concrete river. One night I entered our laundry room, flicked on the light, and there a few feet in front of me on top of the dryer stood a mammoth raccoon. Its claws outstretched, eyes level with mine, the beast's loud hiss atonally melded with my high-pitched homosapien scream. We both promptly fled in opposite directions, me to my bedroom, him to who knows where. In this city nature comes to you, and when it does it usually means you did something wrong. The fact was that we left the doggy door open and the raccoon came to feast on our Husky’s kibble. The raccoon was an unwelcome guest, a sign that we had lost control, momentarily opened ourselves to a wild world where unexpected encounters threaten the orderly nature of an unnatural urban existence. I remember that interaction vividly because it’s perhaps the closest encounter with wildlife I’ve had in the eighteen years I’ve lived here. I’ve seen coyotes in parking lots and possums on trash cans but never again has a wild animal entered my home. At that moment so many years ago, the raccoon became a real, individual thing; it became the raccoon instead of a raccoon. Soon after our nocturnal stare-down, I found myself creating imagined narratives about its life, and I think my housemates and I might have given it a name. In his keenly observational book, Wild Ones: A Sometimes Dismaying, Weirdly Reassuring Story About Looking at People Looking at Animals in America, journalist Jon Mooallem observes that: "From the very beginning, America’s wild animals have inhabited the terrain of our imagination just as much as they‘ve inhabited the actual land. They are free-roaming Rorschachs, and we are free to spin whatever stories we want about them. The wild animals always have no comment." We use animals as stand-ins for what we are when we’re not ourselves. They are sounding boards echoing displaced self-analysis. It’s in the language we use every day; you are sly as a fox and the president is a pig. Our dog reflects a personality we wish we had. Even unknown or extinct creatures like the dodo take on broad humanistic traits, aided, in no small way, by their endless caricatures in animated, Disneyfied forms. 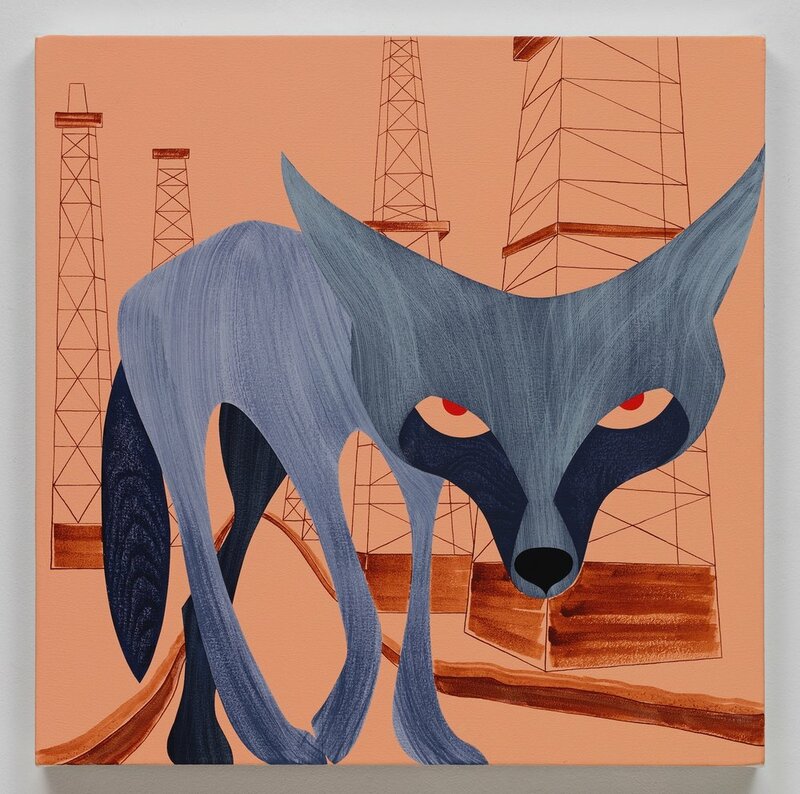 My remembrance of that raccoon encounter, buttressed by Mooallem’s assertion, comes crashing together when I look at Hilary Baker‘s recent painting series Predators, a collection of portraits of common city-dwelling animals in unpopulated, starkly monochromatic LA landscapes. Though her images of Angeleno critters are decidedly less naturalistic than Audubon's birds or Walton Ford‘s frenzied bestiaries, they do ask, in surprising ways, that we consider our relationship with our non-human neighbors. At first glance it would seem strange a seasoned painter like Baker, who’s been making highly structured, formally challenging, and stylistically evolved works for over thirty years, would turn to picturing side-eye crows and deadpan foxes. For years Baker has made impressive paintings tackling weighty subjects like monumental architecture, memorial construction, urban decay, and primordial geometric landscapes. Her previous work has conjured dialogs with the likes of Bernd and Hilla Becher, those impenetrable German photographers who sought to document the typology of industrial modernity. And Baker’s images of fragile masonry readily welcome comparisons with Philip Guston’s clunky comic creations. Baker’s painting cred, accrued from decades of hard work, is undeniable. But in this new series, she diverts, going in a wholly new direction, in search of caricatured and penetrating anthropomorphism. Baker’s new works can at first come across as unsettlingly familiar, almost negligible in their resemblance to the cartoonish characters populating children’s TV. In Pensive, she pictures a lemon-yellow curvilinear cat with a silhouette of arced interlocking legs and an arabesque tail topped with an oversized chevron-like head containing huge, iconic, red oval eyes. This feline could easily make an appearance in almost any vector-based animated show on Cartoon Network. But if one only concedes to this perfunctory interpretation, one misses the possibilities of seeing this painting as part of a larger project that obliquely asks that we consider our relationship with a constructed and illusory “natural” world. If you stop and look at her subjects, examine their composition and stare into their big, penetrating eyes, it becomes apparent that these paintings have much more than mere surface. Baker uses the simplified vector as an alluring tool, something lending itself to scalable harmony. There is, after all, a reason this kind of compositional device is an industry standard in logo and commercial design; it’s both mechanically expedient and pleasing to the eye in various printed and digital platforms. The fact is that any contemporary viewer knows this kind of image-making even if they can’t quite place it; it’s the visual language underpinning much of today’s identity-based consumables, particularly those geared towards children. Spend twenty minutes watching The Disney Channel, and you’ll see what I mean. A native Angeleno and no stranger to this region’s animated landscape, Baker’s is self-aware of the baggage carried by her compositions. Her forms are purposeful, and her paintings are intended to please - at least at first. I believe it’s this familiarity, the work’s intentionally pleasing nature, that draws the viewer in, providing a seemingly comfortable moment of recognition rooted in our collective understanding of what it means to make animals into cartoons. Baker’s creatures have personalities; Marcel, the dog, has a somber but funny surprised guilt about him; Baker’s Baldwin Hills coyote stares at you with bored resignation. A pigeon in a painting titled Night, Olympic Boulevard, seems right out of Animaniacs, with dopey bulbous eyes and a plump body defying the laws of flight. An image of a snake, titled The Adolescent, appears about to hypnotize, recalling serpents from Disney’s The Jungle Book and Robin Hood. This is not an unreasonable analysis. The paintings almost demand one give them animated life, attribute quirky voices, backstories, and interlacing narratives amongst different characters. In front of Baker’s work, one cannot help but project a childhood fascination, give into anthropomorphic tendencies. It’s this automatic personification that begins to give the paintings meaning beyond their first-glance appearance. But once you’ve locked eyes with the group another kind of recognition takes hold. One of the first things that stand out in Baker’s Predators series is her animal subjects’ recurring stares; they look outwards, often directly at the viewer. While not all meet your gaze head on, the frontality of their pose implies an awaiting or fleeting glance, the acute inevitability of a visual confrontation; they make you aware of your presence as viewer. When staring at Baker’s paintings, I’m reminded of the words of the immortal cultural theorist John Berger (may he rest in peace), from his essay, Why Look At Animals: "The eyes of an animal when they consider a man are attentive and wary. The same animal may well look at other species in the same way. He does not reserve a special look for man. But by no other species except man will the animal’s look be recognized as familiar. Other animals are held by the look. Man becomes aware of himself returning to the look." It’s not unreasonable to say that Baker’s animals stare back at us, almost in accusatory judgment. But what is the implication of this gaze? Baker’s are not paintings of particular or specifically important animals; there’s no endangered species, no pictures of P-22, the Angeleno mountain lion with near celebrity status. Baker’s aren’t images of historical animals, like the paintings of the first Russian cosmonaut dogs hanging in the Museum of Jurassic Technology in Culver City. While some of Baker’s creatures have names, like Marcel, implied by their corresponding titles, they are otherwise anonymous. They are like extras, one of many contrived characters, icons standing in for all urban fauna. Except for two deer pictured near Pacific Ocean Park, every animal is alone, isolated in an expansive, often sketched out urban scene. Baker uses quick brushstrokes to highlight signature aspects of her chosen landscapes - the metal armature of water towers in Downtown LA, oil wells in Baldwin Hills, tract houses in Panorama City, an awkward frame resembling LA City Hall. The background color in these landscapes leans towards darker hues, with night scenes directly implied by sunset silhouettes. The signs of human existence are here, but human figures remain absent. In this way Baker’s paintings are in keeping with established Angeleno noir; with sharp shadows and the sense of impending unease signifying that the facade of perfection is about to slip away to reveal cynical truths. It’s in the very construction of the paintings we begin to see that things are not as they seem. Once one passes the register of character recognition in these works - the understanding of the animal’s animated referent - another strange physical characteristic appears conspicuous. Baker does not render her animals in any realistic manner, with hair, fur, or scales. Instead, each animal is composed of refined faux wood grain, often in impossibly unnatural colors. Honeyboy, a painting of a cat, has a shockingly cherry-red head with strategically placed knots forming the folds of its ears. Baker’s Wicked fox seems collaged from two sets of harmoniously stained wood panels. Yet no viewer would claim to think these paintings were made from actual wood, their sleek flatness and dayglo colors make sure of that. No, we know these are forms made to look like wood, but not enough to actually fool the eye. The craft of painting wood grain to create believable veneers, a practice called faux bois, literally meaning “fake wood,” has a long history dating back to the origins of faux finishing in ancient Mesopotamia. Where things get interesting is when the technique of marquetry comes into play. This craft employs an artist combining multiple veneers, sometimes created through faux bois methods, to create figurative compositional designs. The result is often a piece of furniture or interior architectural surface like a door or wall that appears, at least from a certain distance, to have pictorial elements made of several wood specimens. The more diverse the collection of wood, the more the finished composition signifies an ability to source valuable materials from distant lands (often controlled by colonizing empires). This craft reached its peak in the 19th century, spurred on by the confluence of international trade, newfound transcontinental interior design trends, and the display of wooden furniture made of all sorts of exotic species at World’s Fair exhibitions in mid-century France and England. Concurrently, developments in the manufacture of decorative wooden elements available for mass consumption made household objects like fireplaces, tables, wainscoting, etc. available to a growing and eager consumer class. Made of cheap material like pine, these domestic accouterments took on new signification when painted to look like dark mahogany or warm sandalwood. If you couldn’t have the real thing, why not have its ersatz look-alike? The legacy of this willingness to accept a faux veneer stays with us today, seen plainly on most IKEA table tops. But Baker’s faux bois technique doesn’t pretend to mimic any real wood; it’s the grain that counts. In her work, we see an arrangement of forms whose physical composition has historically represented the materially unavailable. As with her use of vector composition, Baker’s faux bois plays on what we already know, but perhaps don’t consider. It’s a doubled, self-evident verisimilitude; we know full well there’s no wood in sight, we are not supposed to believe the materiality of what is in front of us. But within this play of appearances is a dialog about fake and real, natural and unnatural. That these animals are faux bois is one register of falseness. That they are obvious caricatures composed with vectorized, cartoonish referents, underscores another kind of unreality. Taken together, they create a scenario that heightens the connection between the subjective gaze of the viewer as an agent of control, and its object: the represented animal, a collage and creature made from aesthetically deceptive gestures. We are our own unreality gazing back at us. Again, prolonged consideration is rewarded in Baker’s work, so it’s worth considering her titles further. The series is called Predators, a name aptly applied to most of the creatures in her paintings, most evident with the presence of dead mice in the mouths of the cats and birds she paints. But not every animal sits that high in the food chain. What are we to make with her painting of a pigeon, a decidedly non-predatory animal? Or a rat? Or the waterfront deer? These are prey and quite ubiquitous prey at that. The conclusion is obviously that the predator is elsewhere, most likely embodied in the viewer who looks at the painting. In discussing the distance between man and the animal world, a world which man continuously tries to encapsulate in mediated representations, from children’s animations to stuffed animals, Berger highlights what he sees as an ideology of objectification: "In the accompanying ideology, animals are always the observed. The fact that they can observe us has lost all significance. They are the objects of our ever-extending knowledge. What we know about them is an index of our power, and thus an index of what separates us from them. The more we know, the further away they are." While it might seem ridiculous to anyone unwilling to take an inquisitive hike through her recent work, it’s entirely possible that Baker’s Predators series aligns with Berger’s analysis. Perhaps in her image of a wide-eyed raccoon one has the opportunity to ruminate on this dialectical imbalance, the projection of human personification into a void that speaks back with silence and a trapped, reflected gaze. It’s an unwelcome picture, that, seen from a distance might appear harmless, but when brought too close, like an unwelcome feral guest, confronts us with questions about what we did that got us in this situation in the first place. Jon Mooallem, Wild Ones: A Sometimes Dismaying, Weirdly Reassuring Story About Looking at People Looking at Animals in America (New York: Penguin Books, 2013), 8.
 see "Why Look at Animals?" in John Berger, About Looking (New York: Vintage Books, 1991), 4-5.